Written by chris maroulakos on Thursday, April 15th, 2010 at 10:00am. 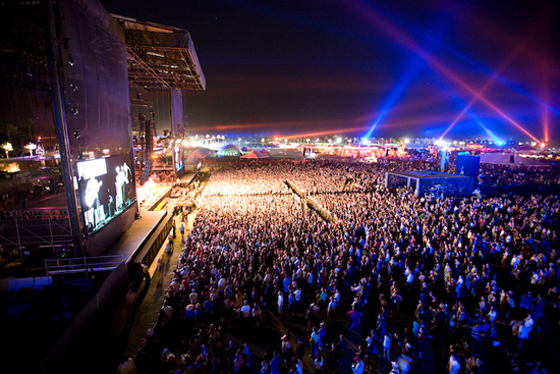 As it does every year, the Coachella Music Festival is about to descend upon Indio, California. From April 16 – 18, the one-horse town will be transformed into an indie music mecca, with hipsters converging from far and wide to soak up the tunes and 115-degree heat. Coachella can be a terrific time but also a taxing one, so you’ll want to get your mandatory three-day ticket’s worth. To help ensure that you don’t risk all that dehydration and sunstroke for nothing, your friendly neighborhood Owl and Bear have compiled a list of this year’s must-see bands. Them Crooked Vultures – Forget fellow Friday headliners Jay Z and LCD Soundsystem; this hard rock supergroup will be the ones to give the opening night a swift kick in the pants. The Avett Brothers – The Avetts’ country-fried ballads pull off the rare feat of getting your toes tapping by yanking on your heartstrings. Yeasayer – The Brooklyn band’s Odd Blood is one of this year’s weirdest and most wonderful releases. Don’t miss the chance to get your groove on with a bunch of sweaty strangers. Dishonorable Mention: Vampire Weekend – The NYC band just released their second album, Contra. Unfortunately, they still sound a lot like Vampire Weekend. Faith No More – The first of the festival’s two high-profile reunions finds the always reliable Mike Patton reuniting with his most famous band. Dirty Projectors – Bitte Orca was one of last year’s best releases, and it’s every bit as good live. Give yourself over to the finest, most intricate harmonies in rock and roll. John Waters – I’m not even sure if the cult director of Pink Flamingos and Serial Mom will be playing music, but — whatever he does — it ought to be memorable. Camera Obscura – The Scottish band crafts emotionally sweeping ballads with a dreamy, 60s-pop center. Frightened Rabbit – Speaking of Scotland, be sure to check out this emotional, cathartic band. They’re living proof that all you need to do to make emo badass is to sing it with a brogue. Pavement – The festival’s second high-profile reunion should be one for the books. Indie rock’s founding fathers dust off their old classics for what may well be the performance of the year. Thom Yorke – The Radiohead front man performs some solo material alongside his new band, Atoms For Peace. For some reason, Flea plays bass. Phoenix – The French band’s rollicking, exuberant shows have a reputation for getting out of hand. Local Natives – This generation’s answer to Talking Heads are one of indie’s fastest rising bands, and their pitch-perfect harmonies may give Dirty Projectors a run for their money. Matt & Kim – The married couple’s energetic pop-punk should provide a welcome shot in the arm to the festival’s final day. Plus, if it’s hot enough, the duo might take their clothes off like they did in their “Lessons Learned” video.